Tortilla Casserole - Ok, so being back in school full-time as well as working full-time has taken any consistency I had with cooking/blogging away for the time being. 'It makes me sad, but I am just trying to roll with it for now. 'I will also be dropping a class due to the class content being WAY over my head, and it pains me to even admit that, but hopefully it will mean more time for cooking! Usually, when it has been awhile since I made a real dinner, I tend toward wanting comfort food. 'I don't want anything too fancy or complicated. 'So, last weekend, I settled in with a stack of magazines to see what might pop out at me that could fit those requirements. This recipe immediately jumped out to me. 'Normal ingredients? Check. Easy to make? Check. Involves cheese? Check. The recipe comes from Cook's Illustrated/America's Test Kitchen magazine. 'It was a 'Cooking for Two' issue I picked up about a year ago. 'I try to scale down recipes fairly often so I'm not stuck with a bunch of leftovers. 'I confess I am a leftover hater. 'So the idea of a handful of recipes that are already scaled down appealed to me. 'What is great about this one is that you make everything in the same skillet. 'Less cleanup! When reading anything by Cook's Illustrated, or watching the America's Test Kitchen show on PBS, what I love is the way they explain how they arrived at the recipe. 'They'll admit it took them a number of tries before they got it just right. 'This is especially comforting to me, because usually when I make a recipe for the first time, I follow it exactly, and I don't want to doubt that I should have changed something. 'As expected, this casserole turned out just exactly how I thought it would. Delicious! Like I said, I didn't really change anything at all from the original recipe. 'I might have accidentally added too much chipotle pepper, which may have been why it was just a teensy bit hot to me, but that was an accident, and I personally will make sure to add less the next time around. 'I also forgot to break the first half of the chips up into pieces, but I don't think it really mattered. 'Finally, the original recipe said to turn on the broiler first, but in an effort to save energy and not heat the kitchen up so much, I waited until a little later in the process. 'I'll post the recipe mostly how it is in the magazine, but I am putting my own timing in for turning on the broiler. 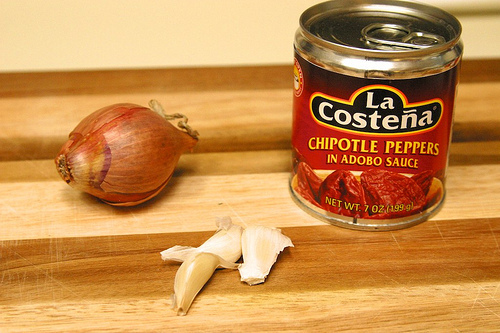 Also: the only ingredient in this recipe that you might not know where to find are the chipotle peppers. 'You can find them in the ethnic foods aisle at the grocery store, somewhere near the canned green chiles. 1. 'Heat 1 tablespoon of the oil in a 10-inch oven-safe skillet over medium-high heat until just smoking. 'Add the chicken and cook until lightly browned on both sides, about 5 minutes. Transfer to a plate and set aside. 2. Add the remaining 1 tablespoon oil, shallot, garlic, chipotle, and 1/4 teaspoon salt to the skillet and cook over medium heat until fragrant, about 30 seconds. (Note: the cooking chipotle pepper made me cough a little, so you might want to turn on the vent or open a window!) 'Stir in the broth and bring to a simmer, scraping up any browned bits. 3. 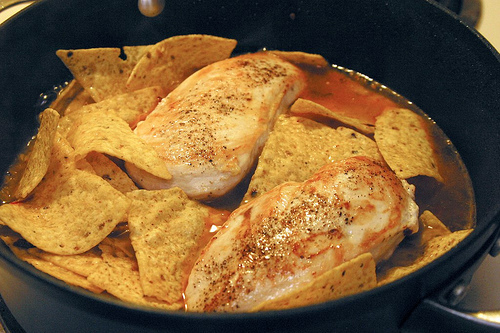 Stir in half of the tortilla chips. 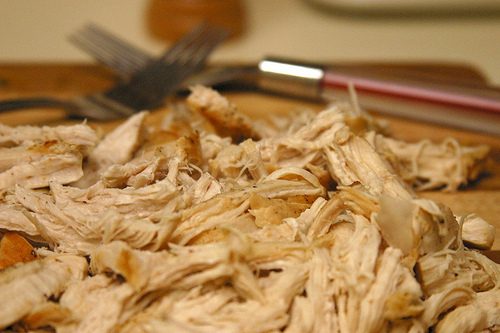 'Nestle the chicken into the broth and chips, cover, and cook over medium-low heat until the thickest part of the breast registers 160-165 degrees on an instant-read thermometer, about 10 minutes. 'When the chicken has been cooking for about 5 minutes, adjust an oven rack to be about 6 inches from the broiler element and heat the broiler. 'When the chicken is done, transfer it to a carving board. 'When it is cool enough to handle, shred it into bite-sized pieces. 4. 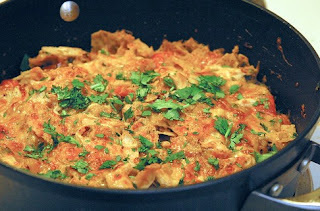 Return the shredded chicken to the skillet along with the tomato, 1/2 cup of the cheese, and 1 tablespoon of the cilantro. 'Stir in the remaining tortilla chips until moistened. 5. 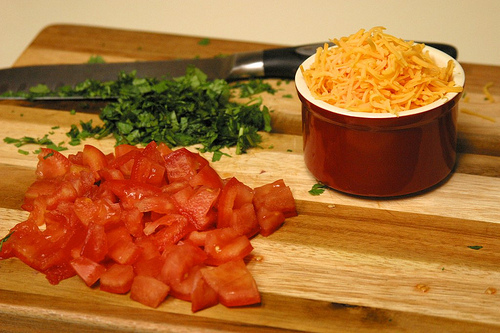 Sprinkle the remaining 1/2 cup cheese over the top and broil until golden, about 2 minutes. (Check after 1 minute, just to make sure it isn't burning.) Using pot holders (the skillet handle will be hot), remove the skillet from the oven. 'Let the casserole cool for 5 minutes, then sprinkle with the remaining cilantro and serve.